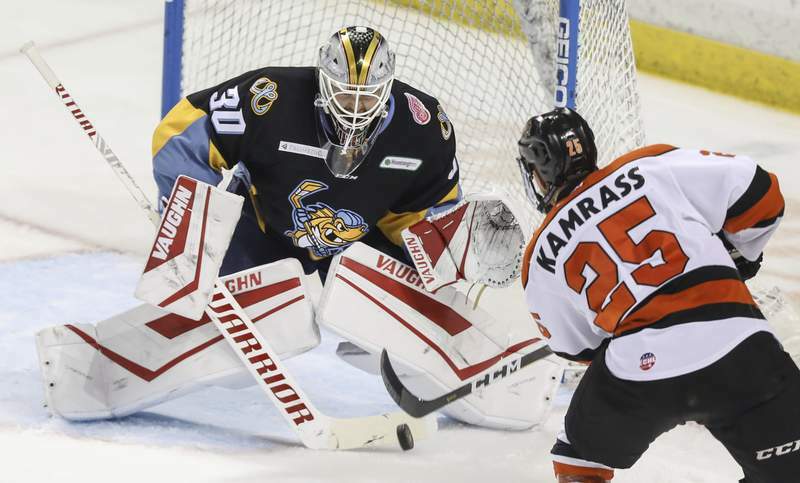 Jeremy Wadsworth | The Blade Komets goalie Zach Fucale stops a Toledo Walleye shot during the second period of Game 2 of the Central Division semifinals Saturday at the Huntington Center in Toledo, Ohio. Jeremy Wadsworth | The Blade Toledo Walleye goalie Pat Nagle blocks a shot by Komets forward Jake Kamrass during the second period of Game 2 of the Central Division semifinals Saturday at the Huntington Center in Toledo, Ohio. 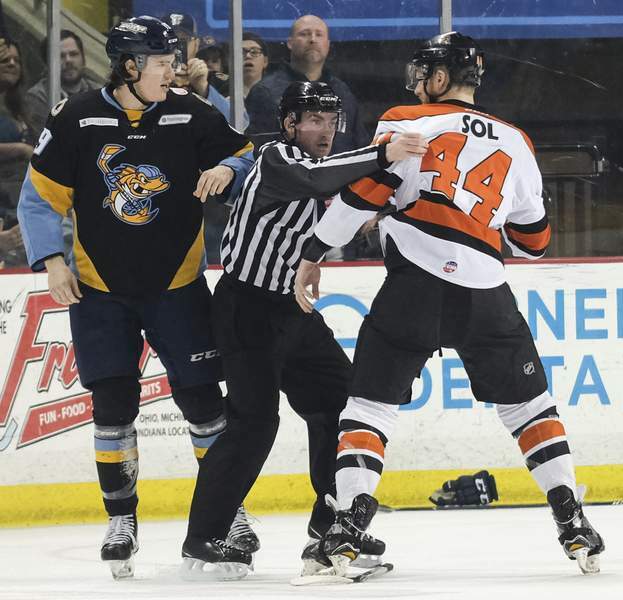 Jeremy Wadsworth | The Blade An official breaks up a skirmish between Toledo Walleye forward Ben Storm, left, and Komets defenseman Cody Sol during Game 2 of the Central Division semifinals Saturday at the Huntington Center in Toledo, Ohio. Jeremy Wadsworth | The Blade Toledo Walleye forward Chris Crane, middle, goes airborne against omets forward Shawn Szydlowski, No. 27, while taking a shot on goal during Game 2 of the Central Division semifinals Saturday at the Huntington Center in Toledo, Ohio. Jeremy Wadsworth | The Blade Komets defenseman Kevin Gibson moves the puck past Toledo Walleye forward Zach Gallant during Game 2 of the Central Division semifinals Saturday at the Huntington Center in Toledo, Ohio. 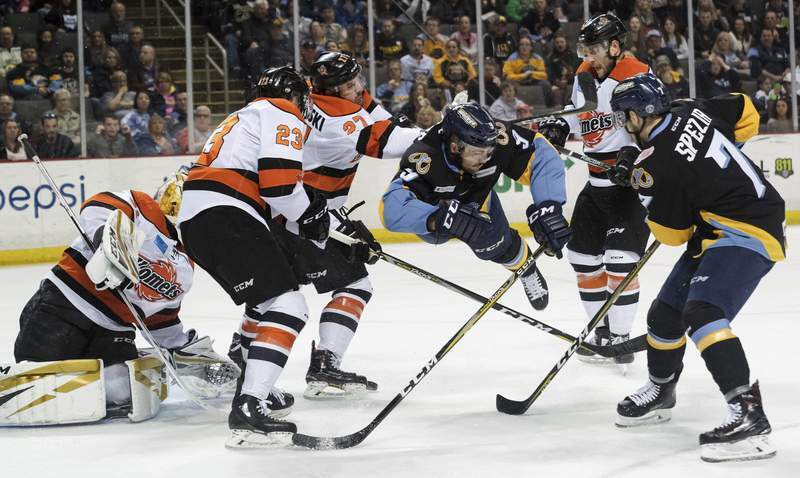 TOLEDO, Ohio – They say in hockey that it’s not a series until someone loses on home ice. The Komets had better hope that’s true because, tonight, things looked awfully lopsided. The Toledo Walleye took a 2-0 lead in the Central Division semifinals thanks to a 6-0 victory at the Huntington Center, where it scored on 4 of 7 power plays. Shane Berschbach, Greg Wolfe, Tyler Spezia and Zach Gallant each had a goal and an assist for the Walleye, which had won 3-2 in the opening game here Friday. Were it not for Fort Wayne goaltender Zach Fucale, who stopped 37 shots, including two breakaways, the outcome would have been much worse in front of 7,723 fans. Toledo’s Pat Nagle stopped 23 shots for the shutout. 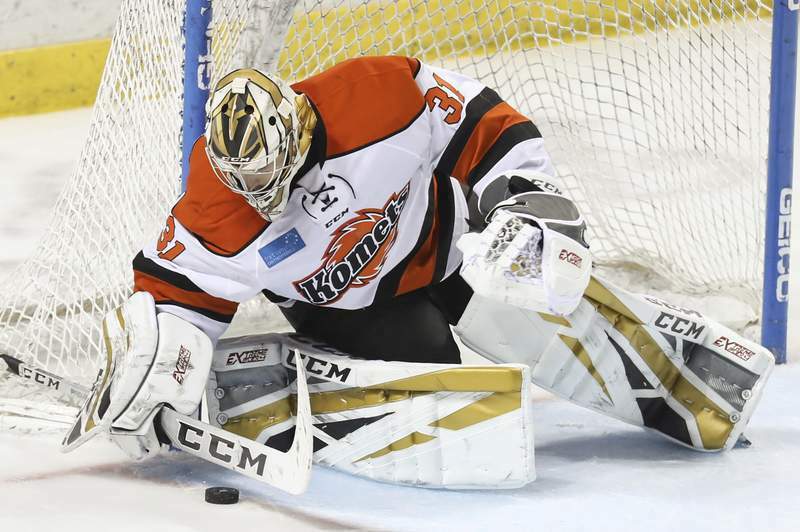 Nagle was in net the previous time Fort Wayne had been held scoreless in a postseason game, and it was in this building in the final game of the 2017 playoffs. Jeff Lerg stopped 24 shots for Toledo that night. The best-of-7 series now shifts to Memorial Coliseum for games 7:30 p.m. Wednesday and 8 p.m. Friday. The Walleye tallied nine of the game’s first 10 shots, including the one from 10 feet out by Wolfe 5:26 into the first period, set up by Spezia’s pass from the corner, which gave Toledo a 1-0 lead. The nastiness of the series’ opening game kept up, including Toledo’s Ben Storm sucker-punching J.C. Campagna; Fort Wayne’s Chase Stewart upending A.J. Jenks with a high check; and Storm getting into battle of sticks after a whistle with Mason Baptista. Toledo took a 2-0 lead when Berschbach’s pass from behind the net set up Ben Danford for a goal at 19:50, all after Fort Wayne failed to clear the puck of the defensive zone. The Walleye outshot the Komets 17-6 in the first period. A 10-player melee broke out 1:48 into the second period, starting with Fort Wayne’s Ryan Lowney checking Dylan Sadowy to the ice after a whistle. Somehow Sadowy emerged without one of the three penalties given by the referees, Chris Pontes and Jeff Parker, and his cross-ice pass set up Berschbach for the goal on the ensuing power play. The Walleye scored on its next shot, Spezia netting the goal during a power play for a 4-0 lead, after another fracas resulted in two of the three penalties going to Fort Wayne players. Another power-play goal for Toledo – a 45-foot Randy Gazzola shot – made it 5-0 at 19:50 of the second period. The third period was fairly dull, though Fort Wayne's Anthony Petruzzelli's hit to the head of Ryan Obuchowski late will probably be remembered by the Walleye. Gallant had a late power-play goal off a rebound. Fort Wayne was 0 for 3 on power plays. This is the fourth time in five years the teams have met in the postseason. The Komets won only one of the previous series – in the second round last year. 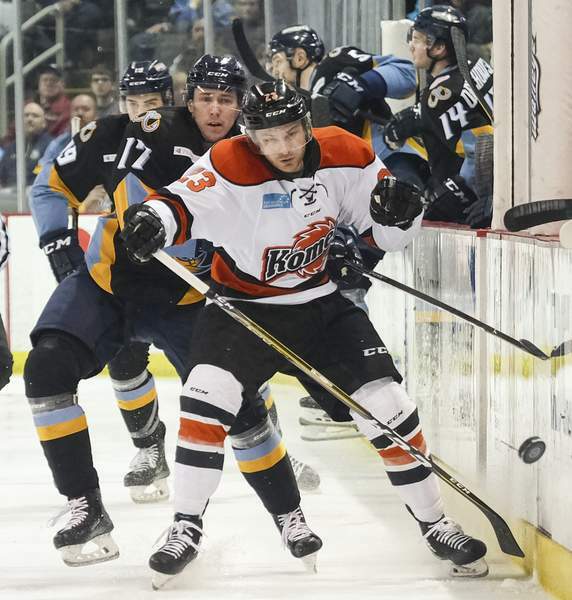 Notes: The Komets made two lineup changes from Game 1, inserting Craig Cescon and Kyle Hope for Cam Knight and Anthony Nellis. Also out were Sean Flanagan, Phelix Martineau (with Laval of the American Hockey League) and Matthew Weis (with Chicago of AHL). … The Walleye released Michael Moffat to get in under the salary cap with the return of Trevor Hamilton from Grand Rapids of the AHL, though Hamilton didn’t play in Game 2.